For the game mode, see science mode. For the parts, see parts#Science. Science is a gameplay feature used to unlock parts in the technology tree when playing in the Career or Science modes by spending science points, which are mainly obtained by performing various scientific activities in different situations and biomes. Science may also be obtained upon successful completion of certain contracts, or gained through the implementation of administrative strategies. Science must either be recovered or transmitted in order to be used on Kerbin to unlock additional technologies. While transmission is generally not for 100% value, experiments may be repeated and retransmitted until 100% of the science value is received. Experiments can be removed from the parts they were performed in and are stored with a Kerbal on EVA. 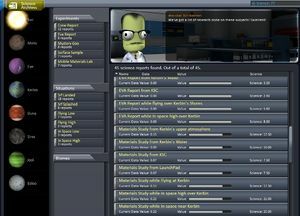 Additionally, science experiments can be stored in and retrieved from any part that Kerbals can ride in, although only one copy of an experiment for any specific situation (e.g. EVA report flying over Kerbin's shores) can be stored per command pod. Science and all related instruments and buildings are made inoperative while in Sandbox mode due to its triviality—all parts are available from the start of a Sandbox game. In addition to the facts collected on this page, you can follow this beginner-friendly Science tutorial. Situations reflect the flight status of the craft or kerbonaut relative to a celestial body. There are six possible situations, some of which may be irrelevant to a given science activity or unavailable on a given celestial body. An atmosphere is required for the situations "Flying Low" and "Flying High" and for usage of the Atmospheric Fluid Spectro-Variometer. As of KSP version 1.0.2, the PresMat Barometer can be used without an atmosphere. If soaring through an upper or lower atmosphere on a trajectory to an escape from the planet or moon's sphere of influence, the situation is assigned as "In Space Low" regardless of the presence of the atmosphere. The situation will only change to "Flying High" or "Flying Low" if/when the aerodynamic forces cause an orbit to be captured during the encounter. Biomes are areas of a body's surface specially mapped in KSP game data. Each additional biome grants a separate set of opportunities to do Science Activities, provided the Activity is biome-dependent in the given Situation. Each planet with solid surface and each moon has biomes, because of this several biomes have to be visited with landers or rovers for total research of the given celestial body. This is an overview of all science activities which can be performed and how results differ by biome and situation. Activities performed within one sphere of influence(SOI) have no effect on the Science Points that can be earned doing science activities within the SOI of any other celestial body. The top row of the chart names each Activity; the left hand column shows the six possible Situations. Each intersection shows whether the Activity is possible for a given Situation and, if so, whether it differs by Biome or gives one Global result for the entire celestial body. Activities and situations requiring an atmosphere are italicized and colored. Surface: Splashed currently can only be accomplished on Kerbin, Eve, and Laythe. The following Activities are performed by Kerbals during an EVA or from within a crewed command module. Surface Samples can be taken by kerbonauts when performing an EVA on the ground (or from on top of a landed or splashed craft) or in water of a celestial body. The results vary by biome and situation (landed or splashed) just as with craft. However, there is one detail to note: a Kerbal swimming in the water is splashed, but a Kerbal standing on top of a splashed craft is landed. So two different surface samples can be collected from any floating craft. In Career mode, Surface Samples cannot be taken without having the Research and Development Facility and Astronaut Complex upgraded to second level. EVA Reports are performed by kerbonauts on an EVA. The results vary by biome and situation (landed, splashed, or "flying"). There is one detail to note: a Kerbal swimming in the water is splashed, but a Kerbal standing on top of a splashed craft is landed — up to three different EVA reports can be collected from any floating craft. The easiest ways to take a Flying Low report are to jump from the surface or hang onto a ladder. Only one EVA Report per biome/situation combination is necessary. A kerbonaut can only take and hold one EVA Report at a time without storing it in a Command Pod, though reports retrieved from a Command Pod have no limitations on how many of a type can be carried. Asteroid Samples can be taken by kerbonauts when performing an EVA close to an asteroid. The samples give various results depending on the altitude of the orbiting planet. Crew Reports can be created in any manned command pod. Reports uniquely differ between celestial body and situation. Because the transmission efficiency is 100%, repeating them or transmitting them multiple times yields no additional Science. If a command pod has taken a Crew Report but not transmitted it, it cannot take a new report even when in a new situation, biome, or sphere of influence. This limitation can be circumvented by having a kerbonaut on EVA "take data" from the command pod. Even if they store the data in the same command pod it was taken from, the Crew Report will be treated as just another piece of data to store. A second Crew Report can be taken even in exactly the same spot; no additional points are yielded by duplicate Crew Reports though. Experiments done by separate parts like the Mystery Goo™ Containment Unit behave similarly to Crew Reports. They may be performed in different flight phases and on different celestial bodies returning different results. Each module can only store one result at a time, but a result can be sent home with an antenna to allow the experiment to be performed again under the same or under new conditions. Data can also be extracted from the module by a kerbonaut during an EVA. There is a penalty for transmitting data home instead of recovering the module to Kerbin. Since version 0.23, transmitting or collecting data renders the Mystery Goo™ Containment Unit and SC-9001 Science Jr. disabled for the remainder of a flight. If the craft has (or can be docked with) a fully crewed lab, it can reset those modules at a cost of time and electric charge. Since version 1.0, these modules can also be reset by a scientist on EVA, allowing a craft with a scientist on board to collect multiple results (from different situations and biomes) on a single mission, without needing a full lab as part of the craft. 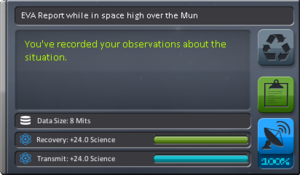 The results collected and stored during a mission can be transferred to a lab at the end of the mission (or taken back to Kerbin). The transmission efficiency caps the maximum returnable science with the experiment via antennae. To gather all scientific value experiments needs to be recovered. With the release of 1.0, transmission efficiency drops radically on experiments that have already been performed and transmitted. If an experiment is recovered, transmission efficiency for that experiment drops to zero (situation and biome specific). The Base- and Max Value of celestial bodies other than Kerbin have to be multiplied by their body-specific recovery multiplier listed below. Flyby: Only the periapsis is within the SOI. Orbit: The periapsis and apoapsis are within the SOI and the orbit does not intersect the surface. Suborbit: The apoapsis is outside of the atmosphere and the periapsis is below the surface. Flight: The apoapsis is within the atmosphere. The periapsis is usually below the surface but doesn't have to be. Requires an atmosphere. Landed: The craft is touched down on the body. Splashed down: Landed in an ocean. Requires an ocean. 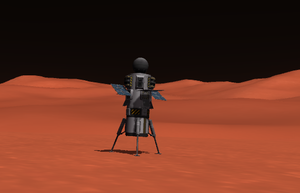 To receive science closer to the maximum science value in one trip, it is possible to have multiple command modules on a craft which can separate when landed so "multiple craft" can be recovered. Decouplers or separators can be used for this, when using light probe cores ejection force should be reduced as to avoid high velocity lithobraking. Each celestial body has different multipliers applied to the collected scientific data, based upon where it is taken in relation to that body. Biomes do not affect these multipliers. The altitudes given in this table determine the altitude above mean sea level of the boundary between lower and upper atmosphere and between near and outer space. The upper atmosphere extends to the atmospheric height and the outer space extends up to the end of the sphere of influence. As of 0.24, players can access various contracts at Mission Control while playing in career mode. The rewards for accomplishing contracts vary and can include a significant amount of Science. The most efficient way to gather all science on a planet or moon from orbit is to enter a polar orbit at or near 90 degrees inclination, set the periapsis to the lowest point that will not impact the surface or the atmosphere and adjust the semi-major axis to twice the sum of the radius of the orbited body and the margin between high and low orbit. This will cause the craft to be at various times both high and low over every biome on the body, eventually gathering all science that can be gathered from orbit. For example, with the Mun this means a polar orbit of 90 degrees, with a periapsis of 20 Km and an apoapsis of 620 Km. Both the periapsis and apoapsis should be exactly at the equator for best results. The various strategies that can be implemented at the Administration Facility while playing in career mode also have a significant effect on science income. Each strategy is based on trading one "resource" (reputation, funds, or science) for another as each is earned. Thus, at the cost of reputation or funds, the player can boost their science income. Conversely, the player can spend science to boost one of the other two resources. For example, the strategy "Outsourced R&D" yields science at the cost of funds, while "Open-Source Tech Program" will take a fraction of the player's science every time it is earned and convert it to reputation. Anywhere from 5% to 100% of the income from any of the resources can be converted into one of the others. A filterable list of the experiments which have been performed so far can be accessed through the “Science Archive” tab in the Research and Development window. The entries show what data have been brought back and whether more data from repeating activities can be gathered. If the bar below an experiment is not completely full, as shown in some of the examples on the right, the experiment can be repeated to gain additional science. This is also useful to see what biomes and situations haven't been covered yet and provide the richest opportunities. This page was last edited on 11 January 2019, at 00:41.